Sugaring is a couple months off, but we’re getting ready. It’s one of those things that some self-reliant people do. I don’t use “self-reliant” in any political or reactionary sense, just to say we enjoy making use of the resources at hand to help feed ourselves. Last year we tapped only three trees and in about four week’s time collected around 80 gallons of sap. This boiled down to two gallons of syrup. We are fortunate to have nearby neighbors who have mature sugar maple trees in their yards. They encourage us to tap the trees and hang buckets, and we provide them each with a fancy half-pint bottle of the final product. This spring we have about ten trees marked. Will we get three times as much syrup? Could be. We don’t produce it to sell; that’s a level of work we aren’t prepared to undergo ourselves. We don’t have a license to sell it, as I assume would be required. (More on this a little later.) We would need to hire people to boil sap around the clock. We would need sophisticated equipment. No wonder it costs — what now? — $50 and up a gallon? We have a wood stove in the garage, and about a cord of dry firewood set aside. We have a big stainless steel pot to sit on top of the stove. And we collect in individual pails hung one or two on a tree. The pails need to be emptied daily, sometimes twice a day, into a larger bottle and carried by hand across the neighborhood to be dumped into a larger container — a plastic barrel or six-gallon water can. The collected sap is like water and doesn’t even have any appreciable flavor. We strain it over the steel pot and just boil it continuously until it eventually begins to turn light brown and sticky. With the wood stove, we can let the fire die out each evening and resume some time the next day. There are instruments to use in the process and strict standards of sugar content and color for marketable syrup. We just stop boiling when a teaspoon dipped into the pot and cooled in the hand yields what seems to us to be the right consistency and flavor for table syrup. This year we want to try taking it a step further and let a little of the syrup reach the consistency of taffy or even lump sugar. We will report our progress on this some time around mid- to late March. 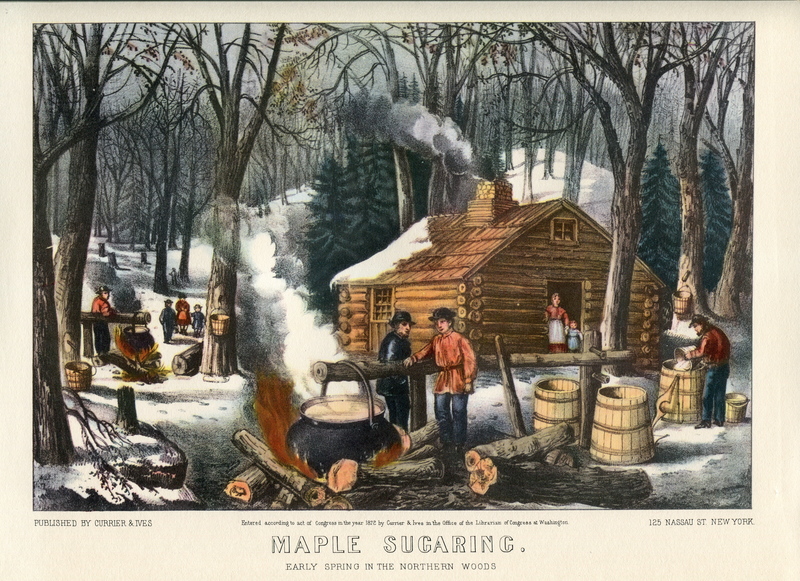 Maple sugaring is just one way we use nature’s resources. We collect berries — in fact there was one point this fall when we had 22 gallons of blueberries in our freezer. These are among the easiest fruits to preserve and to use by the handful from a freezer bag. (We’ve sent gallons home with relatives and friends, so we’re down to ten or so now.) We have picked and frozen as many as ten quarts of raspberries and ten quarts of blackberries in one recent season. We have a few uncultivated apple trees at our disposal and have frozen un-counted bags of sliced apples and uncounted quarts of applesauce this year, much of it from drops that others would pass by. Our freezer in recent years has held a quarter of a moose (road kill that we brought home, butchered, and shared), half a deer obtained the same way, and about 70 pounds of fresh fish filet (salmon and trout) after I made a two-day fishing trip with friends to Sodus Point, New York, to fish in Lake Ontario. The other three guys wanted to go fishing but didn’t much care to actually use the fish they brought home. In addition to our small vegetable patch and a couple of herb plants, we also use, sparingly, wild mushrooms of a couple varieties we trust, and we cook and freeze the pulp from a jack-o’lantern now and then. To these resources we add a loaf a week of homemade bread and a few batches of home-brewed beer a year, and it serves to substantially reduce our food cost while, it can be argued, improving our health. If we were to sell any syrup, these thoughts come to mind: We would be collecting money for it. The Internal Revenue Service would, if they found out, require that we report the income in order to pay a tax on it. But we would counter that we very well may not be re-couping our cost of supplies and fuel. We would need to spend time doing the accounting or hire an accountant in order to persuade the IRS, but that wouldn’t be enough; it’s not enough merely to avoid violating a law (regulation actually — the “law” merely says something like “There shall be clean air, and the unelected bureaucrats will write the regulations to clean up the air.” We must prove that we did not violate the don’t-hide-the-money (tax) law, or else we’d have violated the compliance law requiring that we prove we did not violate the tax law. So we’d have to keep receipts and file tax forms just to prove there was no taxable income. And that takes away from syrup-making time. What’s more, the cost may include getting a license to sell the product — we don’t know. In the course of my “human resources” job, a few years ago, I tried to discover whether a certain person, whom the local hospital was going to employ temporarily, needed to be licensed by the state in order to perform the service. I thought it would be a simple question, which I could research at http://www.maine.gov or by calling a state office. What I discovered about who needs to be licensed is summed up in the attached PDF file, Licenses in Maine. When I called one state office after another, each one confessed they could tell me only about activities that would fall under that office. The agriculture department, for instance, had no idea whether a wrestler needed to be licensed in order to perform for pay in Maine. Each office I called was entirely unaware about wrestlers. So I helpfully pointed them to the list on their web site. I also made quick to alert them that my question is valid — does someone need a license in order to fit prosthetics in Maine? — because if one goes by the list, a registered nurse doesn’t need a license (when I know darn well it’s required). But does an EMT need a license? You know they do. Not on the list. A medical doctor? Not on the list. A registered Maine guide? Requires a license but not on the list. A victualer? Not on the list, but we’ve all seen a victualer’s license posted in any mom-and-pop store that sells Italian sandwiches. A landlord? A campground operator? The list today at http://www.maine.gov/pfr/professionallicensing/professions.htm seems to have changed from 2007. Wrestlers are no longer listed, but stationary steam engineers have been added, as have tramway inspectors. The hazardous profession of interior design, thank God, is still on the list. We wouldn’t want you to be endangered or exploited by an interior designer. And so, I don’t know. I have planted six apple trees in my yard. Am I now an orchardist in need of a license? If I produce six gallons of maple syrup, do I need a license? There is no way to find out except to do it and see whether an inspector shows up. Perhaps a tramway inspector in the off-season goes around to see what activities other people are up to and slaps them with a summons for making syrup or plowing snow or building picnic tables without a license. And that is why this story about the bucolic pleasure of making syrup is a rant against the pervasive evil of the State. (Capitalized not in reference to the state of Maine but to imbue the term with the god-like status that any entity of government assumes for itself — the way Albert Jay Nock always capitalized State as an inclusive term encompassing all levels of government). If I do need to apply for a license, I will make sure the papers are well-smeared with syrupy thumbprints. 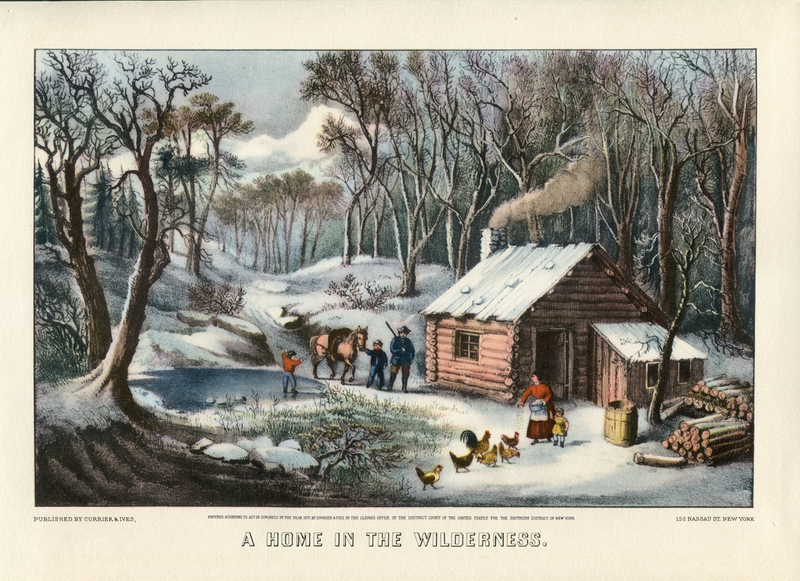 No, I don’t live in a log cabin like this. But I’m ready to if driven to it, and I am definitely not riding the wave of economic and social change that is reflected in urban culture. “If driven to it” merely means that, if I have to forfeit any more of my assets for another federal bailout or blunder, I’ll still have the skills and the means to live in a space like this home in the wilderness. I’m already in the wilderness, and I thank God every day for that.